I have searched eBay for matches and found no results. 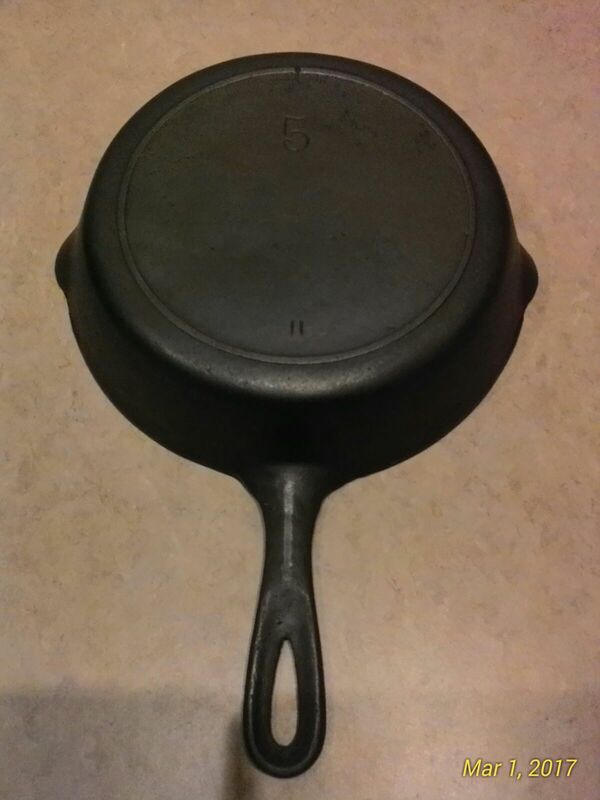 How common/uncommon is the #5 single notch skillet? Sorry I don't have either RB or BB I also have a lid with #5 incised in the underside that's a perfect fit including over the spouts. I'm guessing it is later as it has drip points and a rougher cast quality. I have found far more 3 notch than 1 notch skillets, but they are out there. With it being an older piece, they will be slightly more scarce to find in the wild. does it have the really curvy script 5? This made me think to look! I do have a Lodge 1 notch # 5. Have a lot of 3 notch too.